The belemnite rostrum from the upper Lower Bajocian of the Russian Far East that was earlier attributed to the Family Cylindroteuthididae, the species Cylindroteuthis confessa Nalnjaeva, and considered as the most ancient representative of the genus Cylindroteuthis is here placed in the family Megateuthididae. This belemnite is here described as Mesoteuthis soloniensis Nalnjaeva et Dzyuba, sp. nov. The analysis of belemnite distribution suggests that only representatives of the family Megateuthididae (genera Megateuthis, Mesoteuthis, and Paramegateuthis) inhabited the Far East seas in the Bajocian. Original Russian Text © O.S. Dzyuba, T.I. 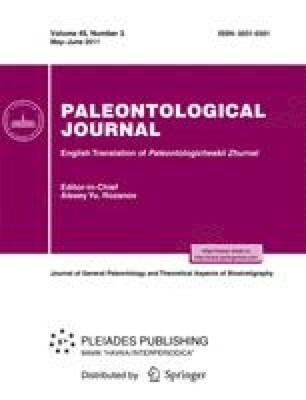 Nalnyaeva, 2011, published in Paleontologicheskii Zhurnal, 2011, No. 3, pp. 25–30.